Readers from across the province held silent protests outside the offices of MLAs to protest against $4.8 million dollars in cuts to libraries. The reduction in funding, which was announced in the 2017 provincial budget, includes a $1.3-million cut to the Saskatoon and Regina public library systems. 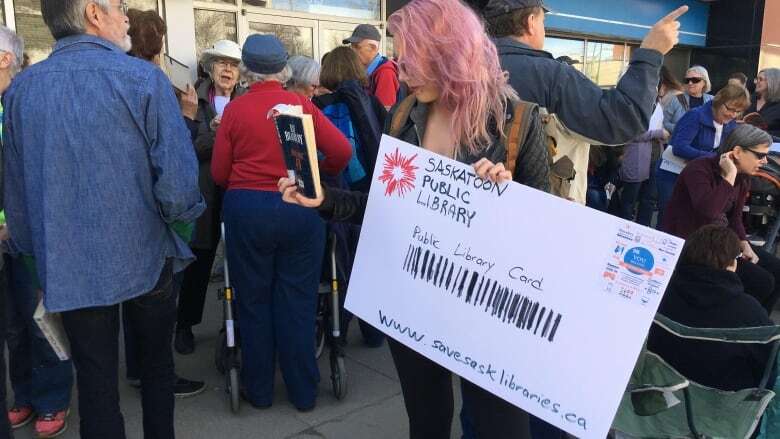 In response, libraries across Saskatchewan have said they will no longer be able to run the "One Province, One Library Card" program that allowed regional libraries to loan books back and forth. Education Minister Don Morgan is asking libraries to use other approaches to find the money. … as well as outside the Saskatoon provincial cabinet office. … to Melfort in the northeast. Social Services Minister Tina Beaudry-Mellor was visited in Regina. And Premier Brad Wall's hometown of Swift Current got into the action as well. Even a Girl Guide troop got involved.